According to the U.S. Department of Labor, the dental profession is one of the most dangerous. And one reason? Something very, very small. Dust. Given that there’s an aging population, there’s more demand for dental appliances, like bridges and denture sets. That means dental labs are running at full tilt—and dust from sandblasting and grinding appliances and molds enter more indoor air. These particles are often smaller than five microns, stay suspended in the air a long time and are easily breathed into the lungs. What’s more, the grinding dust on surfaces is easily kicked up from the simple movements of people in the lab environment, creating more suspension. So how do you combat it? Unfortunately, typical heating and ventilation systems do a great job of recirculating air, not cleaning it. So, dust and other particulate just gets moved around—or worse, keeps getting suspended in the air, making it even easier to breathe in. Wearing a surgical mask doesn’t help either. According to a statement from the Canadian Centre for Occupational Health and Safety, surgical masks don’t filter out submicron particles and don’t account for leakage around the edges of the mask. 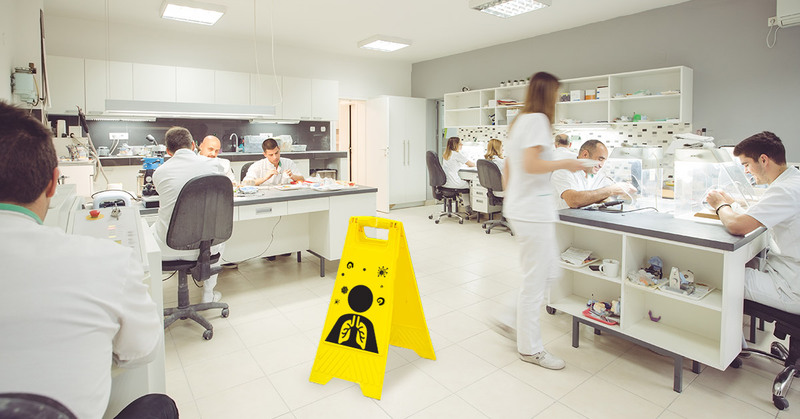 Clearly, the best way to eliminate the threat of dust floating throughout a dental lab is by cleaning the air itself. The complete line of AeraMax Professional air purifiers does just that—getting at the root of the dust problem by removing it—along with other harmful particulate, chemicals, pathogens, bacteria and volatile organic compounds—from indoor air, using an advanced True HEPA filtration system that effectively and efficiently traps tiny particles. Given that the AeraMax Professional air purifier continually scans the environment—working when it senses pollutants in the air—you’re assured you can eliminate the danger lurking in the lab.